Devanand Balasubramanian, Managing Director, Sundev Appliances, says the tie-up in October last year with Sweden's Electrolux to distribute its Kelvinator brand of small kitchen and home appliances was a turning point for the Mumbai-based company. Devanand Balasubramanian, Managing Director, Sundev Appliances. Photo: Rachit Goswami. The deal, he says, helped Sundev to expand its market reach. "Our salesmen go to distributors and retailers with the Kelvinator brand name and also offer them other brands such as Desire," he says. Sundev, for instance, reached out to distributors who were not selling air coolers but still accepted the Kelvinator brand of air coolers. 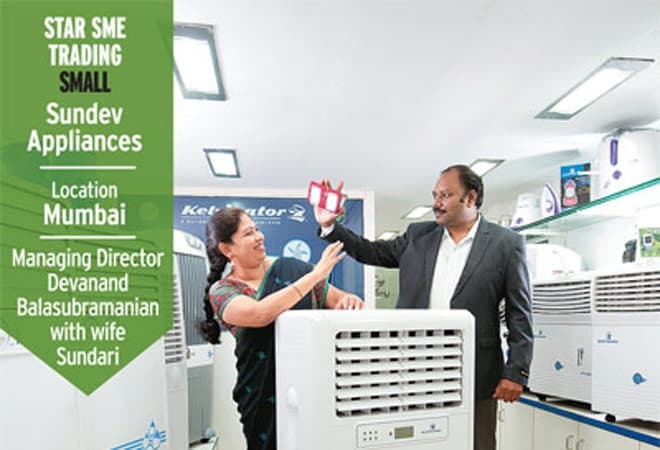 "After the sales team ensured the availability of the brand at retail points, customers started picking Kelvinator over other brands," he says. "The entire gamble worked out." The tie-up led Sundev, named as a mix of his and his wife Sunanda's name, to increase its manpower by five times to more than 250 people. Sundev has also roped in actor Raveena Tandon for a nationwide launch of its Desire brand of products. Sundev has 110 distributors that supply to more than 1010 retailers. The company also manages the entire sourcing, labelling and distribution of products for private labels such as Metro and Specers, while also having worked for Carrefour. The sourcing and distribution abilities help it to act as a carrying and forwarding agent for other products. Balasubramanian says that, though Sundev faces logistical and financing challenges, yet it wants to distribute smaller brands rather than big ones. "For smaller companies, creating a delivery infrastructure is not easy. We help them deliver conveniently and quickly at a local level," he says.